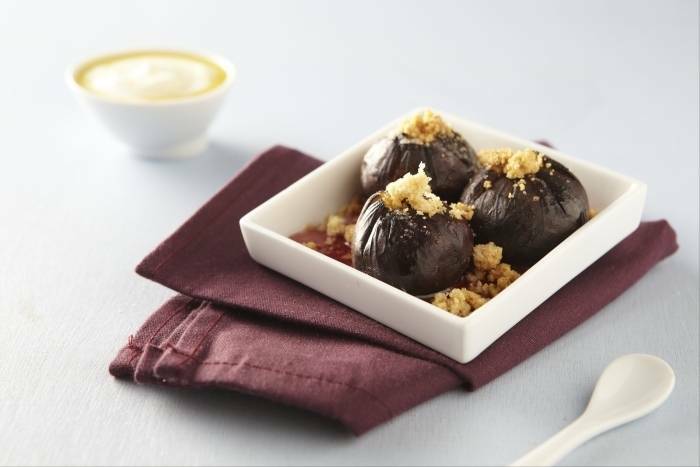 Fresh figs sprinkled with brown sugar and oven baked before being served with honeyed Greek yogurt and an almond crunch. Prepare the almond crunch by mixing the butter, the sugar, the ground almonds and the flour in a bowl and crumble it between your fingers. Spread the crumble on a baking tray and cook in an oven for 20 minutes. Cut a deep cross through the centre of each fig, but don't cut all the way through. Sprinkle with the brown sugar and place the figs in an individual oven proof dish. Put them in the oven and bake for 10-15 minutes, until the sugar is bubbling. Serve with the honeyed greek yogurt and sprinkle over the almond crunch.